The new BONElike™ Skulls are made of a new material that allows an absolutely natural reproduction of even finest anatomical structures for the first time. Bones made of 3B BONElike™ look real, have an absolutely natural feel and almost exactly the weight of a natural bone. This version represents a complete midsagitally sectioned skull. It can be disassembled into both halves of the skullcap and the base of skull, the nasal septum and the complete mandible. To demonstrate masticator movement, the lower jaw is mounted flexibly. An excellent skull to study the bony structure and the complicated anatomy of the human skull. I'm a medical student in anatomy, and both my older peers and instructors had all recommended that I purchase a skull for study at home. I am so glad that I chose this one! 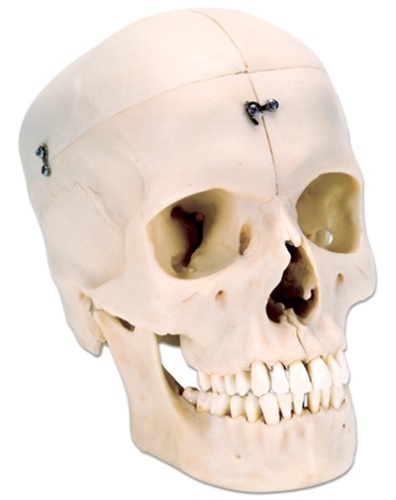 Many of the lab objectives can only be identified on a real skull or a close replica, and this model does a better job at reproducing the 'real deal' than any of the other model skulls available in the teaching lab. The midsagittal cut is an especially unique feature. For any student looking to do well in Head and Neck, this is the perfect tool for quiet study at home rather than in the noisy lab!